This morning, not able to stand the rubbish on the beach at Besant Nagar, Chennai, I found a large plastic bag and started picking plastic trash along the shore. After a bit (the bag was full and heavy enough for me to want to drag it along), two young men joined me, took the bag from me, while I used one of the smaller ones I’d found. Not much conversation (except to wonder at people’s behaviour), but I did learn that they were in the merchant navy and very conscious of effects of plastic in the seas (they have to follow strict rules while at sea). Then, a young girl took one of my plastic bags to do her bit. Finally, when I’d done as much as I could, looking for a trash can (none near the water), I looked inland, saw 3 boys carrying two large (trash?) bags, walked toward them and — indeed, they belonged to the environment club at Sishya school and were happy to divide my spoils between them (guess they get credit by weight? volume? didn’t ask). Picking up the plastic I was thinking of how different the beach was from the “blissful old days,” and remembering my father who, after retirement, spent his mornings beach-combing (between stints of social work in the neighbouring areas) and acquired quite a collection of shells. 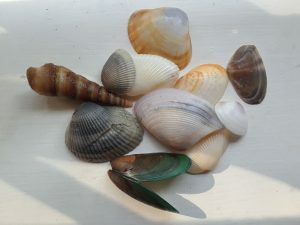 Between bits of plastic, I too managed to pick up some shells. This entry was posted in Life is like that only, Society. Bookmark the permalink. I like your collection, especially the green bivalve shell (both the parts are sort of joined)!